There are 16 different species of wild rabbits in the United States, with the most common being the eastern cottontail. 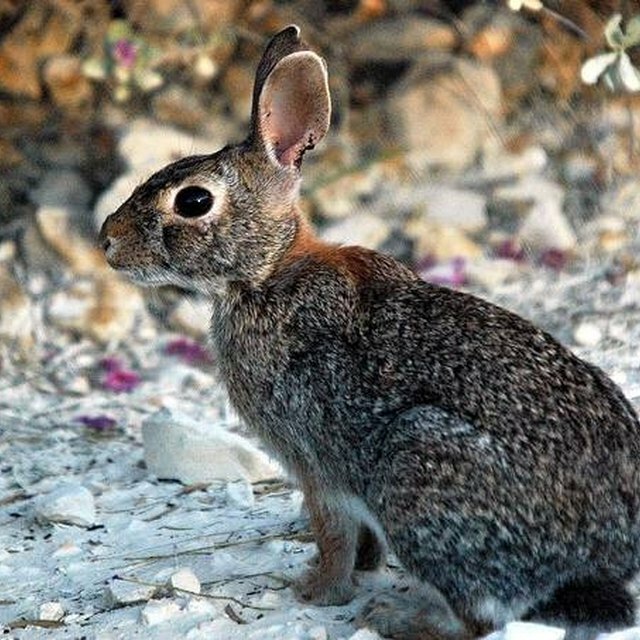 Wild rabbits such as this have short life spans due to the fact that they are subject to being killed by many predators, but they keep their populations up by having as many as five litters of young each year. Wild rabbits have diets consisting mostly of plant matter and they prefer a habitat where there is both a plentiful food source and cover for them to escape from enemies. The common misconception is that rabbits are rodents, but they are not. They belong to the family Leporidae and to an order known as Lagomorphs. This order also includes mammals, such as pikas and hares. Also there is the thought that wild rabbits and domesticated rabbits are closely related, but in truth the domesticated versions are distantly related to one certain species of wild rabbit. Rabbits possess long ears, with some reaching 5 inches in length. They have excellent hearing to detect the presence of danger and strong hind legs that enable them to run and jump quickly when necessary. Most species of wild rabbits have a short tail, with the cottontail's being white, thus giving it its name. The soft fur of the wild rabbit can vary between brown, gray, and mixtures of the two colors and it serves to keep the rabbit warm in cold weather. Most are no longer than a foot and weigh just 2 or 3 lbs. When it is time to bear young, a wild rabbit will make a nest out of grasses and its own fur, usually in a shallow depression beneath something that provides it with protection and cover. Sometimes they will use the abandoned burrow of another animal. The female can bear young all year round in warmer climates and have as many as two to six little ones in a litter. The cottontail, for example, will breed from February all the way through to September in their northern range, with the gestation period lasting only 28 days. The young are born blind and lack fur but are weaned in short order, normally in as little as five weeks, before moving out to live on their own. The wild rabbit will try to escape danger by running from it in a zigzagging pattern. It will attempt to make it to a burrow or a thicket of dense brush or thorns where a predator is unable to follow. They can run as fast as 20 miles an hour for a short distance and have even been known to climb a tree to escape. If caught out in the open a wild rabbit will stand absolutely still and hope to avoid detection. They have been known to turn and fight when there is no other alternative, using their hind legs to kick at a foe. 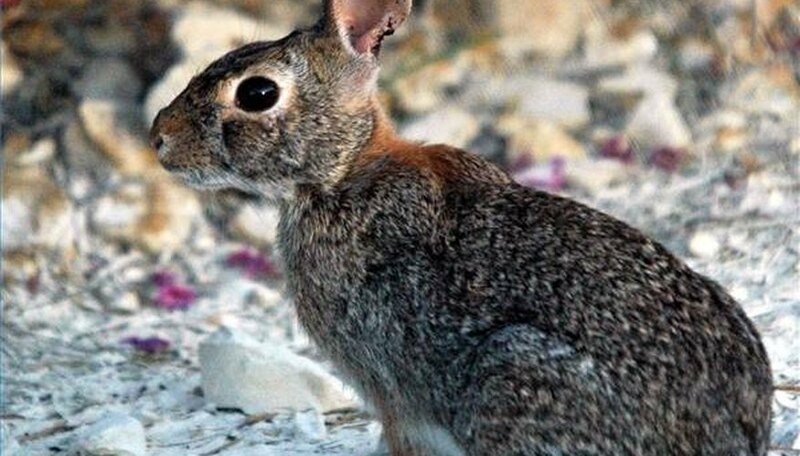 Wild rabbits fall victim to such animals as badgers, foxes, wolves, coyotes, snakes, hawks, eagles and owls. Rabbits are also hunted and trapped by humans for their meat and fur. All wild rabbits are herbivores, eating a steady diet that is mostly grass but sometimes twigs, shrubs, leaves and other plants. They can be a nuisance in gardens, feeding on vegetables, but they can be kept out with a 3 foot high fence of chicken wire in most cases or repelled by certain chemicals. Wild rabbits obtain the majority of their water from dew and from the plants they consume. They are coprophagic, meaning they will eat their own droppings to extract whatever nutrients they failed to the first time around. Once they have done this they excrete hard pellets that are full of fiber. Lindell, John. "About Wild Rabbits." Sciencing, https://sciencing.com/wild-rabbits-4673060.html. 24 April 2017.